HgCapital Trust, the tech-focused private equity fund, is another of my long-term holdings. Its recent results looked very impressive, but it has ambitious (and perhaps risky) plans to become a much larger entity. A recent study by the AIC that looked at the most successful funds since ISAs were launched in 1999 shows HgCapital in a highly creditable eighth spot. It’s certainly no slouch. Indeed, HgCapital would have more than quadrupled your money had all your ISA subscriptions been invested in it over the last 20 years. I haven’t held as long as that. I first bought in 2010 and added more in 2011, 2012, 2014, 2015 and 2016 (guess I nodded off in 2013). However, I reduced my position a little in 2018 as I thought it had become a bit too large as a percentage of my portfolio. I re-invested the proceeds in another private equity trust called Princess Private Equity. Note: the share price has skipped ahead in the few days since I wrote this article thanks to a bullish write-up in Questor and a small disposal. HgCapital Trust was launched in December 1989 but was then known as Grosvenor Development Capital. It later became Mercury Grosvenor before changing its name to HgCapital Trust in 2003. Hg has managed HgCapital Trust’s assets since 1994. This firm (Hg that is) was originally the private equity arm of Mercury Asset Management. Mercury was bought by Merrill Lynch in 1997 and the private equity business was the subject of a management buy-out from Merrill Lynch in 2000. It renamed itself Hg (as science buffs will know, Hg is the chemical symbol for mercury). Today, it is an independent partnership with around 140 people in the UK and Germany. 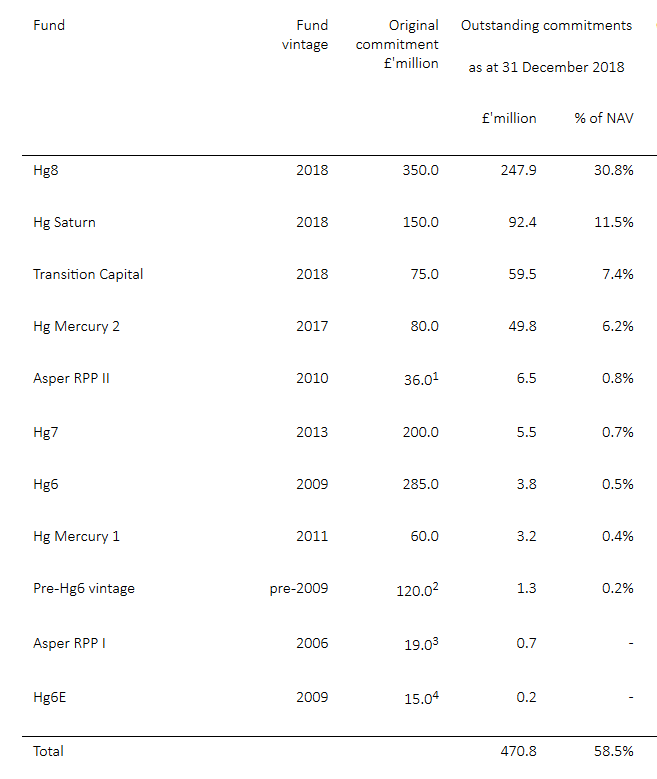 Hg manages about £6bn, of which HgCapital Trust accounts for £0.8bn. Most private equity vehicles are quite diverse but HgCapital has a clear focus on technology (80% of its portfolio at present) and services (the remaining 20%). It’s a pretty concentrated portfolio right now with 30 companies. The top two positions account for nearly 35%, the top 10 for 70% and the top 20 for 89%. Of the top 20, twelve of them saw their value rise last year. The sole faller, ironically, was a company called Achilles! You can also see it’s a pretty young portfolio in terms of “investment vintage” as HgCapital likes to call it. Nearly 70% by value has been invested over the past three years. Only 6% is more than five years old. However, the underlying story can be a little more complicated, especially with larger investments where there are often multiple private equity firms involved. For example, HgCapital first invested in its largest holding, Visma, in 2006. It added more money in 2008 and 2010. Later in 2010, it sold most of its holding only to reinvest in the business in 2014 and then again in 2017. Common themes are business-critical software/services with a high proportion of repeat revenues. And established companies that have high profit margins, lots of intellectual property, and fragmented customer bases are also preferred. It seems to be onto something as most companies in its portfolio are growing pretty quickly. Last year, the top 20 increased their sales and profits by 25% and 27% respectively. That was a big step up from 2017, where the equivalent figures were 17% and 15%. But the valuation of its portfolio is pretty punchy at 17 times EV/EBITDA (although that may need a little explanation). EV stands for enterprise value, the total value of a company’s shares and debt. EBITDA is profits before interest costs, tax, depreciation (the write-down of capital expenditure over several years) and amortisation (the write-down of goodwill from acquisitions). So EV/EBITDA is a ratio of a company’s value to its annual profits, similar to the more commonly used price-earnings ratio (p/e ratio). EBITDA is often used as a proxy for the underlying cash flow a business generates. Private equity firms often favour it as a metric as it allows them to gauge the cash available to pay off the debt they use for most acquisitions. But EBITDA excludes a lot of costs that are included in a p/e ratio. Very broadly speaking, 17 times EV/EBITDA could be considered equivalent to a p/e ratio of 25 to 30 times. That’s a very high number because it’s anchored to tech valuations in the stock market and because the portfolio companies are growing so quickly. However, if stock market tech valuations did come down significantly, HgCapital’s net asset value would suffer, too. There was an impressive 14.3% increase in net asset value in 2018, which of course was a year that many investments struggled. The share price didn’t do as well, up just 3.5% in 2018, but it’s caught up a lot of ground in the first few months of 2019. HgCapital didn’t publish its December net asset value until last week, so the share price may have been a little behind events. Like many such funds, although an updated net asset value is published each month, full portfolio revaluations are only done twice a year for the interim and final results. Most monthly net asset value updates therefore just adjust for items like the purchase and realisation of investments, exchange rate movements, dividends, and expenses incurred. HgCapital’s current discount to net assets is pretty narrow compared to what it’s been over the last decade. It’s also narrow compared to most other private equity funds, where double-digit discounts tend to be the norm and discounts of over 20% aren’t that unusual. Obviously, if its performance disappoints, then HgCapital’s discount could widen once again. You can see that the last three years have seen particularly strong gains against the FTSE All-Share. This is one reason HgCapital did so well in the AIC table I reproduced at the start of this article. A lot of its gains have come in the last three years, once most of the annual ISA contributions would have been paid in. That said, the FTSE All-Share is perhaps a slightly strange benchmark for this fund, given it’s packed with oil companies, banks and utility stocks. It would good to see comparatives against global and tech indices to get a fairer comparison. Like many private equity firms, Hg has a range of funds which make investments over several years. HgCapital has put money into many of Hg’s funds and is committed to putting in more cash in future as well. These Hg funds are primarily differentiated by the size of companies they target. Hg8 is looking at £250m to £1bn, while Saturn is £1bn+. Transition and Mercury are both £50m to £250m. So, that’s quite a size range, although more than half of the outstanding commitments relate to the £250m to £1bn band. The good news is that HgCapital has an opt-out clause, meaning that it doesn’t have to put more money in if it doesn’t have the resources to do so. And there is no penalty if it goes down this route. Right now, it has £157m in liquid resources and an unused £80m debt facility with the option of a further £80m, subject to the bank’s approval. And more cash is raised when an existing is sold, either in part or in full. 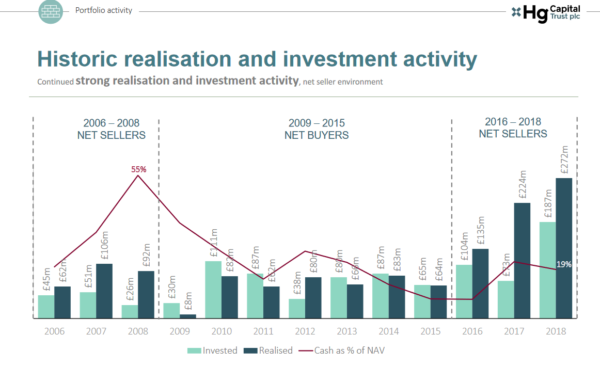 Indeed, about £630m has come from investment realisations over the past three years. The Board has been discussing with Hg the likely timing and potential size of new commitments. We expect to have detailed discussions towards the Autumn of 2019 and enter into new commitments at the start of next year. In order to maintain the Company’s momentum, these future commitments may represent a further step up in size, and therefore the Board will consider a potential share issue, providing the market conditions permit, offering existing and new shareholders the opportunity to subscribe and increase our equity base. It’s good to see we are getting about a year’s notice. But then HgCapital has always struck me as a shareholder-friendly company with, for example, plenty of detail provided on its investments via case studies. Apparently, it does a ‘perception audit’ every few years and following the most recent one HgCapital is soon going to be covered by the paid-research outfit Edison. A new website is coming soon as well. And there’s a 10 for 1 share split being proposed in May’s AGM to improve the liquidity of its shares. An astute buyer and seller? Despite the heat of the current market, we do continue to see attractive investment opportunities in our target clusters, just as we did in the closing stages of the last period of high valuations, in 2005 to 2008. This chart provides more evidence that its timing has generally been quite good. It was a net seller in the run-up to the financial crisis. And it has been for the past three years, too, when valuations have been looking a bit more stretched. It has usually had a lot of cash in reserve, peaking at 55% of net asset value in 2008. HgCapital paid dividends annually until 2017 when it introduced an interim payment for the first time. The dividends have been maintained at 46p for the last three years (prior to that they were a little erratic). The board’s intention is to pay at least 46p a year in future while looking to increase this level gradually over time. Post the 10 for 1 share split, the latest annual dividend would drop to 4.6p of course. The current yield is just 2.3% and I would expect the vast majority of any future gains will be from share price increases rather than dividends. Here we go again with sky-high costs. I do know how to pick them it seems! Private equity trusts tend to be pretty expensive. Champagne lunches and golf days at Sunningdale don’t come cheap it would seem! HgCapital’s ongoing charge last year was 1.9% but leaps to 5.6% when you look at the Key Information Document. The culprit once again is carried interest, essentially the performance fee element of the arrangement with Hg, which is 20% of all gains greater than 8% a year. I think that’s pretty standard for a private equity firm. Carried interest added 3.4% to costs last year, so it’s basically the difference between these two cost definitions. HgCapital’s average net asset value increase for the past three years has been 18%, suggesting carried interest should be in the region of 2% (18% less 8% times 20%), so the sums are obviously somewhat more complex. I don’t like these high costs — who would? — but while this fund continues to perform so well I can (begrudgingly) tolerate them. Should its performance falter, then the carried interest figure should drop dramatically, but this is something that does need monitoring. It was an impressive 2018 for HgCapital and its share price has now doubled over the last three years. Despite this, it still seems to have quite a low profile with many investors. I rarely see other folks mentioning that they hold it. The high valuation level of its portfolio and the big step-up in commitments from next year are a little concerning. So I’m glad I trimmed my holding, despite the fact its replacement has had a rougher time so far. I’m happy to continue with my existing position and wait to see how grand HgCapital’s plans actually are.